Hennessey Performance Engineering has strapped the 2019 Chevrolet Silverado Trail Boss to the dyno to see what kind of numbers the stock 5.3-liter V8 engine manages. It’s the first time we’ve seen the 2019 Chevrolet Silverado take to the dyno for baseline numbers, and the figures show the engine makes 307 horsepower and 332 pound-feet of torque at the rear wheels. Typically, a vehicle loses 10 to 15 percent as power is sent from the engine through the drivetrain. Here, the Silverado loses just over 10 percent of its horsepower. The truck makes 355 hp and 383 pound-feet of torque at the crank. But, HPE doesn’t have just a slew of regular upgrades in store for the truck. 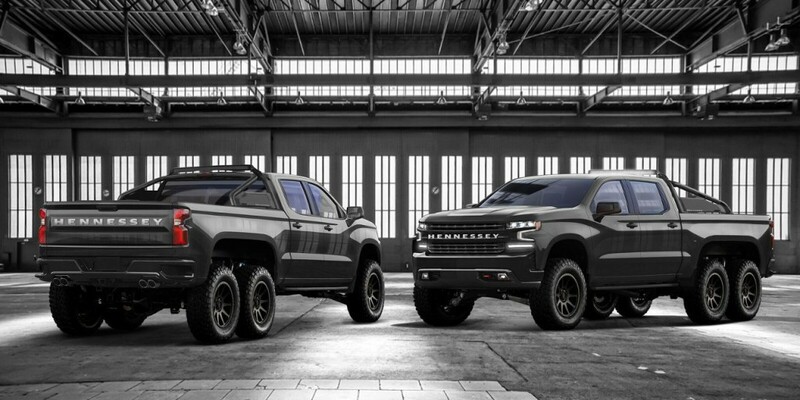 This particular Silverado will be the first Hennessey Silverado Goliath 6×6. The company announced the Goliath as the Chevrolet-badged answer to its Ford F-150-based VelociRaptor 6×6. Like the VelociRaptor, the Goliath 6×6 sports three axles and a redesigned rear suspension to accommodate the third axle. In the announcement, HPE said the truck would feature a modified version of the Silverado’s 6.2-liter V8 engine. Expect a 2.9-liter supercharger to help boost horsepower to 705 hp and 675 lb-ft of torque. And even with the truck’s hulking mass, 0-60 mph times should fall somewhere in the four-second range. None of the upgrades will come cheaply, though. HPE plans to sell the Silverado Goliath for $375,000, which includes the cost of a donor 2019 Silverado Trail Boss. Have a look at how the Silverado performs on the dyno before it goes under the knife to become HPE’s first production Goliath.